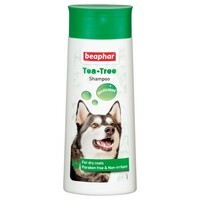 Beaphar Tea-Tree Shampoo has been specially formulated to gently cleanse and sooth irritation caused by grazes, insect bites and fleas. The shampoo will help to restore and strengthen your dogs coat leaving it looking healthy and shiny, and is most effective on dogs with dry skin and will help prevent their skin from flaking. Mildly scented with tea tree oil.